...The local recipients of the grants are Live Healthy Appalachia, Hocking Valley Amateur Radio Club, Hocking County Children's Chorus, and the Laurelville Volunteer Fire Department." "When the Hocking County Children's Chorus held its annual Christmas Concert in December, the packed crowd at St. John Catholic Church thoroughly enjoyed the offerings from the 56-member Chorus. Along with a variety of Christmas favorites and the playing of choral hand chimes, many folks noticed the beautiful new uniforms the children were wearing, thanks to the combined grant dollars from the Logan-Holl Foundation and the Ohio Arts Council. However, there is a bit of a story behind these beautiful turquoise and black outfits. After the grant monies were awarded, the Board of Directors made the decision to purchase the needed material, and then hire local seamstresses to sew the outfits, in an effort to keep those dollars in our community." The Hocking County Children's Chorus held its first theatre workshop of Saturday, Jan. 28 from 10 a.m. to 2:30 p.m. at their music room on West Hunter Street. ...It was a wonderful opportunity for the girls and boys to explore the movements of their animal characters for the production. A few of the high school students shared that they themselves got their start in music and theatre in the HCCC. The Hocking County Children's Chorus will hold its annual Christmas Concert on Sunday Dec. 11 at 3 p.m. at St. John Catholic Church on Market Street. A United Way Agency, the HCCC is open to all children of Hocking County in grades two through eight. This includes children in public schools, private schools, and those who are home-schooled. The chorus is open to children of all abilities. Scot Givens will accompany the Chorus, directed by Therese Karnes. The 56-member Chorus will be singing a variety of Christmas favorites, along with a few surprises mixed in. New this year will be the addition of choral hand chimes. Hundreds of people of all ages lined the streets for the 2016 Hocking Hills Chamber of Commerce Christmas Parade to see the floats, animals, and of course Santa. ...In addition to the entry fee, another change in the parade this year was a $500 cash prize for the best Bicentennial-themed parade entry. The honor of the best Bicentennial-themed float went to Citizens Bank of Logan. Citizens Bank Vice President of Customer Service and Private Banking Mary Wilson said everyone involved worked hard on the float and picked fancy costumes. "We all tried to be in character of somone of the last 200 years. We tried!" Wilson added. "The gift boxes on the float had pictures of the old Logan hospital, Chakeres Theater - it had a lot of history on it. The kids on the float - they came from the Hocking County Children's Chorus." The Bowen House is being transformed into a Christmas wonderland for its upcoming Celebration of Trees opening on Saturday, which is free to the public. ...The Celebration of Trees opening is Saturday from 6 to 8 p.m. The Hocking County Children's Chorus will sing at 6 p.m. and the Scenic Hills Senior Center Choir will perform at 7:30 p.m.
"With the smell of fresh paint still lingering in the air, bubbly choristers scale the risers in the group's revamped practice space. 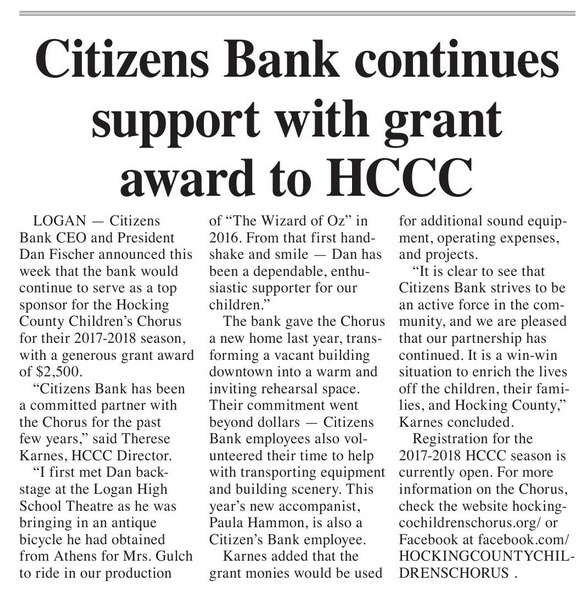 Several excited singers take the opportunity to personally thank Citizen's Bank President Dan Fischer for the bank's generosity in opening up the office space at 96 W. Hunter St., to better fit the needs of the ever-growing Hocking County Children's Chorus." "Two local organizations recently received sizable donations from TransCanada - the Hocking County Children's Chorus and the Marion Township Fire Department. HCCC has grown quickly over the past years and has nearly 60 members at the present time. Due to the increase, the chorus needed a new rehearsal space and equipment..."
...Perhaps it was the opening performance by the Hocking County Children's Chorus under the direction of Therese Karnes that set the tone for the evening when they impressed the crowd with their performance of "We are the World - We are the children." ...[Janey] Saving added that the doors will open at 5:30 p.m. and the Hocking County Children's Chorus under the direction of Therese Karnes, is scheduled to perform promptly at 6 p.m., followed by dinner at 6:15 and the cake auction at 7:30 p.m."
...Saving said United Way of Hocking County, located on 66 E. Hunter Street, helps support 13 local organizations and agencies. They include - American Red Cross; Boy Scouts of America; Elementary Activities for Grown and Encouragement of Responsibility (EAGER); Habitat for Humanity of Southeast Ohio; Hocking, Athens, Perry Community Action Program (HAPCAP); Hocking County Children's Chorus; Hocking County Council on Aging; Hocking Hills Inspire Shelter; Home Away From Home Program; Hospice of Hocking County; Laurelville Community Food Pantry; Longstreth Community Food Pantry; and Smith Chapel Food and Clothing Mission." "The deadline for registration for the 2016-2017 season of the Hocking County Children's Chorus is Monday, Aug. 29. The HCCC is open to all children in Hocking County in grades 2 through 8. This includes children in public schools, private schools, and those who are homeschooled. The chorus is open to children of all abilities." Therese Karnes, director of the Hocking County Children's Chorus, accepts a check for $400 from Dave Vogt, president of the Kiwanis Club, to help with the purchase or risers for the chorus. Risers are multi-purpose platforms used for rehearsal risers, performance risers, and as platforms for the theater productions. ...[Gabe] Stephens and his fellow members of the Hocking County Children's Chorus wanted to make a difference in the lives of those affected by the storms and help ease their minds as they prepare for the upcoming school year." "The Hocking County Children's Chorus float went through the parade as they ang songs from The Wizard of Oz."